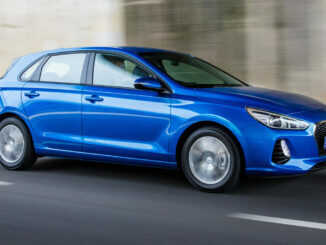 A hot headed sporty little hatch with a surprise in the boot! The latest VW Polo is still an agile little car that has retained that sense of fun and freedom, the GTI is very nippy and corners really well. (Better than my brothers in 1998!!!) I am sure the VW Polo was not designed specifically to be a family car but I want to test just how practical or not it is! I will begin with my biggest gripe and then we can move on!! In the GTI model, the sunroof is only covered with a black mesh, rather than a proper cover, I was cooked every time I drove the car! It really wasn't enough to protect passengers from the Australian sun and the interior of the car was always roasting hot whenever the car was not parked undercover. The interior in the GTI model was a lot less basic than in the base model I tested previously. The GTI model had matte red panelling and detils in the stitching and trims. The media system in the VW Polo GTI is very nice to use and easy to navigate, it does have Apple CarPlay and Android Auto too. The base model did not have in-built sat-nav, but the GTI did. 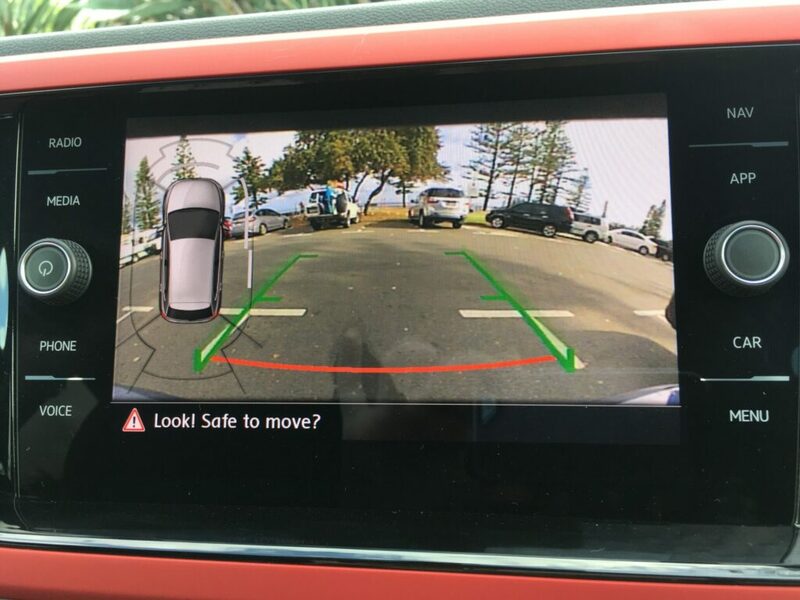 The reversing camera image is of great quality and clear for a small car. 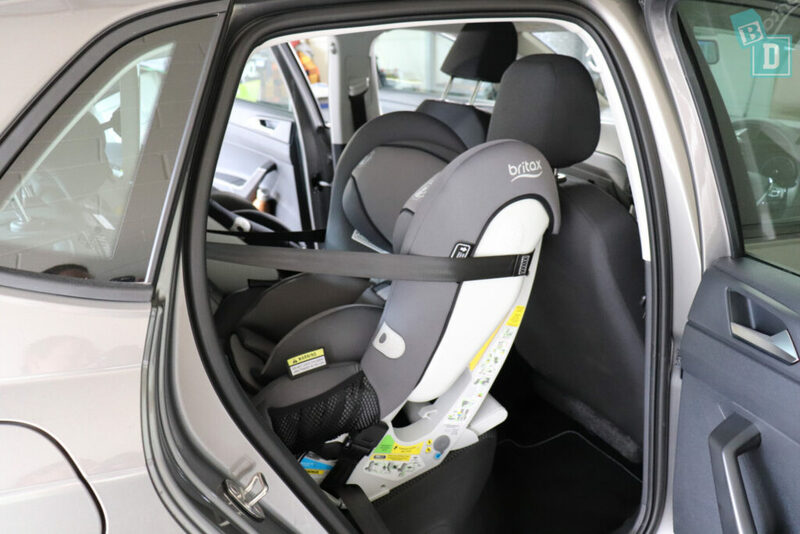 Interior space is a consideration in the VW Polo, the rear seats are comfy with two adult passengers, or I found I could definitely only install two child seats in the back, in the two outer seats. 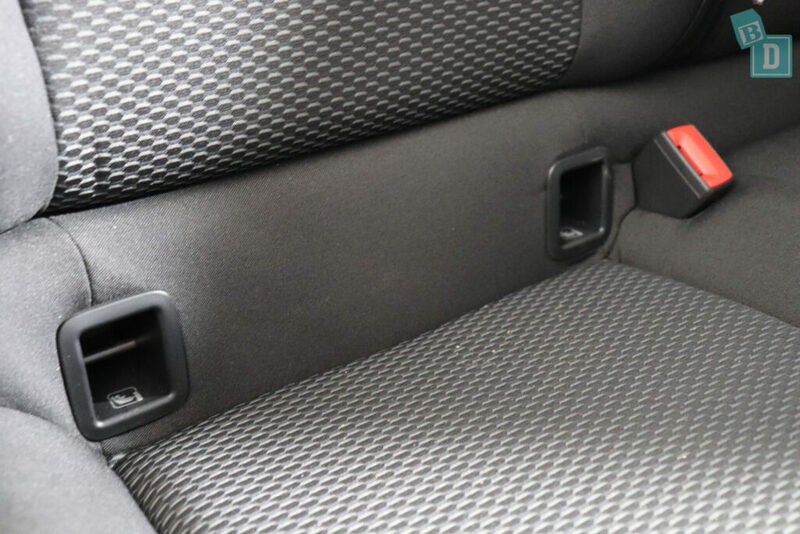 There are ISOFix points in the two outer seats, they are within plastic guides and are nice and easy to connect to. There are top tether anchorages in the back of all three backrests, which are also within plastic guides and nice and easy to connect to. One consideration I am learning with most Volkswagens is the headrests are not removable, which really pushes the forward-facing child seats forward at the top and my daughter moaned continually about it. 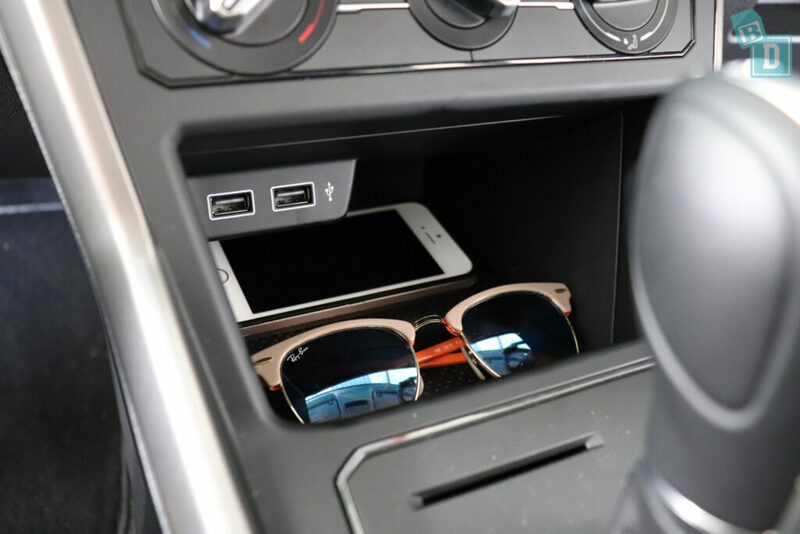 Storage is minimal in the VW Polo, there are the two babycino holders in the centre console and a small well in front of the gear lever that's good for your phone, there is no glasses case and the glove box is small. The door bins would hold a large refillable water bottle which was good. In the back, there are just two small door bins that will hold a large refillable water bottle. The boot space is quite limited as you'd expect. 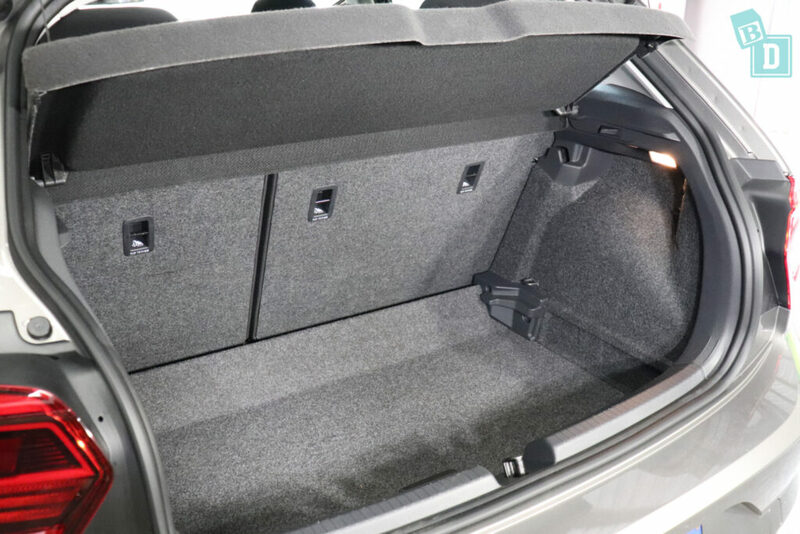 Interestingly, in the basic version it is better because the boot floor has two levels, so when in the lower position, it made storage better but the GTI model did not have the option to lower the boot floor. 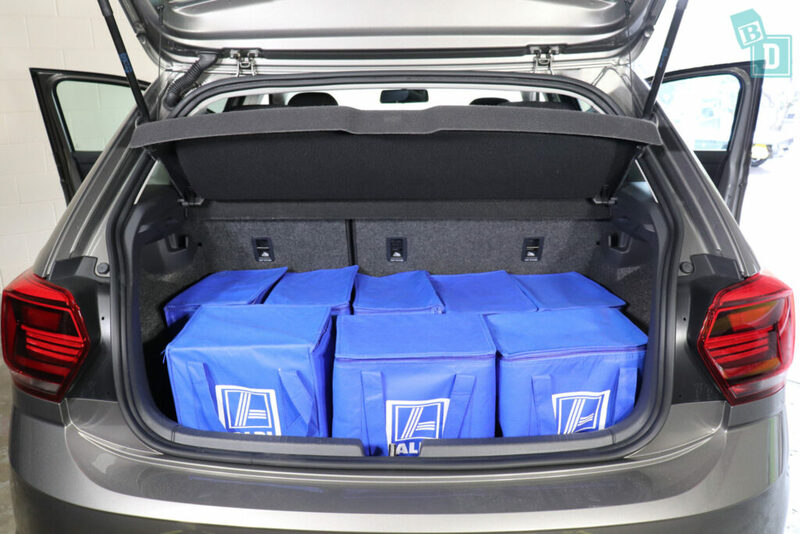 It would fit eight shopping bags when empty, that's the same as the Mazda CX-3 and two less than the VW Golf GTI and the Toyota C-HR. 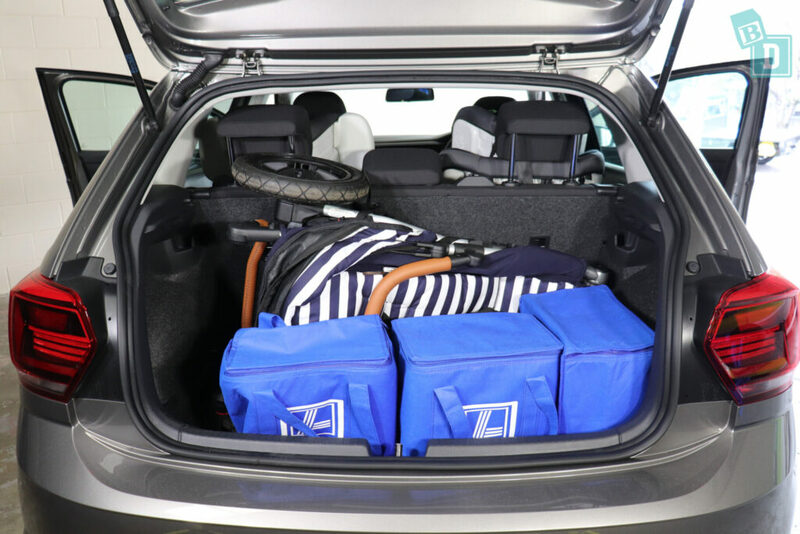 With the parcel shelf removed, the tandem, twin or single stroller fitted in the boot with a shopping bag or two. It'd also be OK for small dog. The basic and GTI model VW Polos are both still the fun cars I remember to drive, they are nippy and the GTI very responsive and corners really well. When I was on my own in the car they had that carefree feel (if you can remember back to that!!) and the ride was not hard or disturbing when my little girl was in the car. In inner cities where parking is a consideration, or you only have one maybe two children and you don't drag too much of the usual baby equipment around with you then the VW Polo could be a practical car for your family. Like the VW Golf GTI, you might have to trade it in for something bigger by the time your little ones become lanky teenagers!! The VW Polo was given a five-star ANCAP safety rating in 2017, applicable to all models from 2018 onwards. 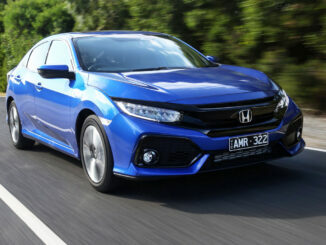 All models have six airbags as standard. How big is the boot of the VW Polo GTI? 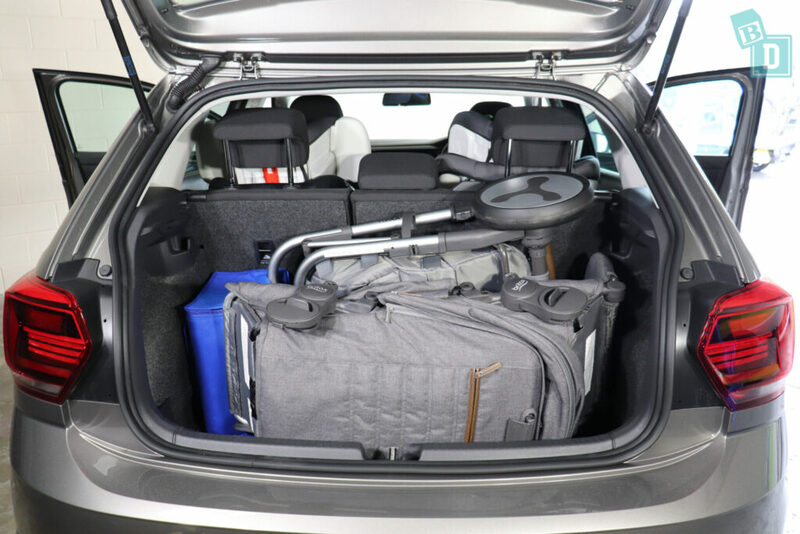 I could fit eight shopping bags in the boot of the VW Polo GTI, which is the same as the Mazda CX-3 and two less than the VW Golf GTI and the Toyota C-HR. 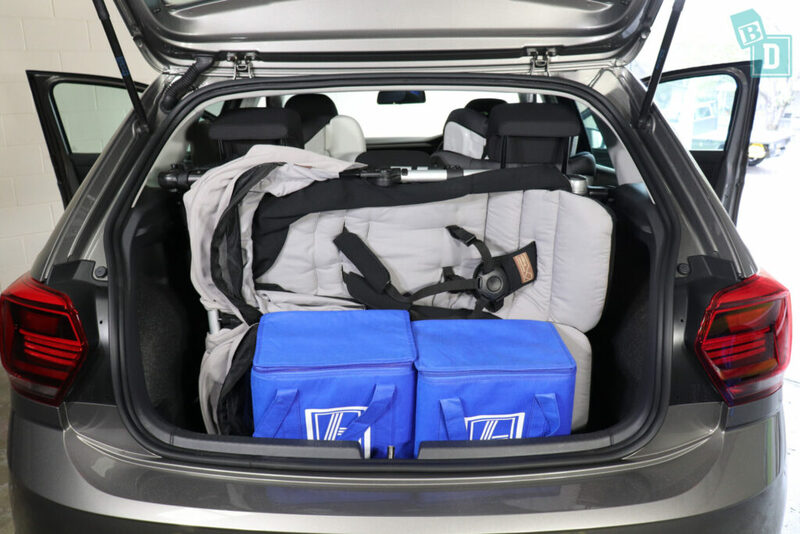 The Mountain Buggy Duet twin stroller fitted in the boot with the parcel shelf removed and two shopping bags beside it. The Britax Flexx tandem stroller fitted in the boot, with the parcel shelf removed and one shopping bag. The Mountain Buggy Urban Jungle single stroller fitted with the parcel shelf removed and three shopping bag beside it. The Mountain Buggy Nano compact stroller fitted with six shopping bags beside it. 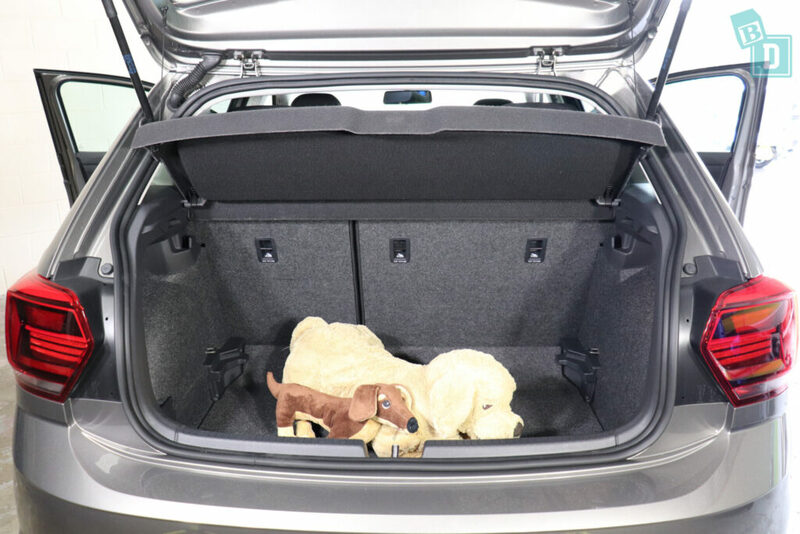 Or you could fit a small dog in the boot if you remove the parcel shelf. 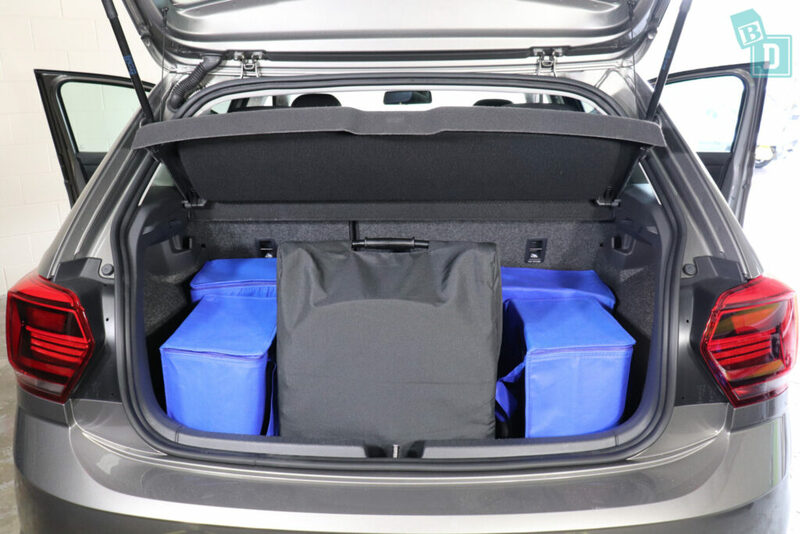 Storage in both models of the VW Polo is minimal. 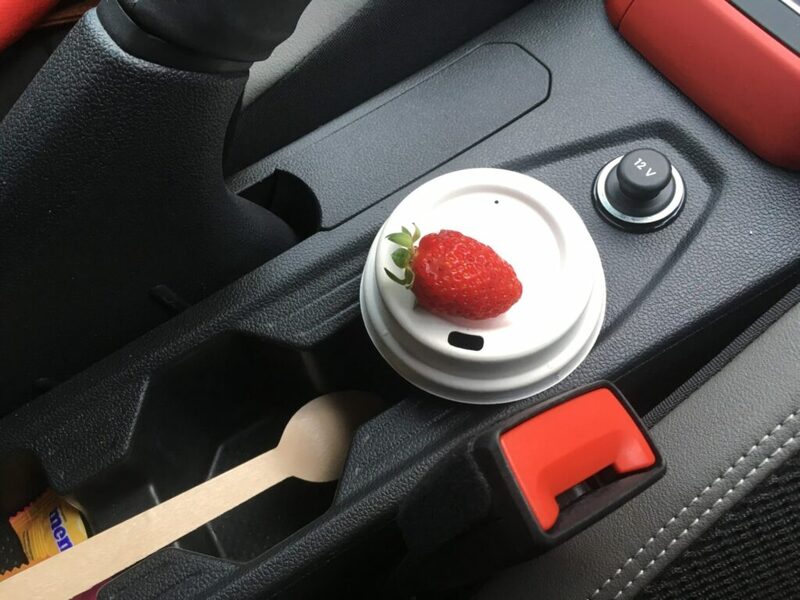 In the front, there are two, small, octagonal shaped, cup holders in the central console, they are not a good size to hold a reusable or disposable coffee cup as they don't sit in them well but I did discover they are perfect for holding my daughters babycino!!! There is no central console storage box in the Polo. In front of the gear lever is a well I found good for my phone and glasses, there are two USB sockets there too. There is no glasses case in the ceiling. 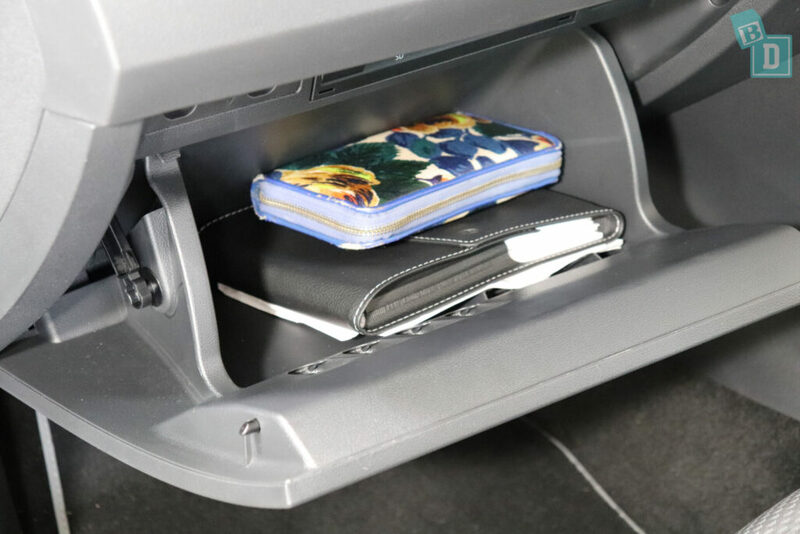 The glove box is small, it would hold my wallet with the manual but an iPad doesn't fit. The door pockets in the front will hold my large refillable water bottle an iPad. 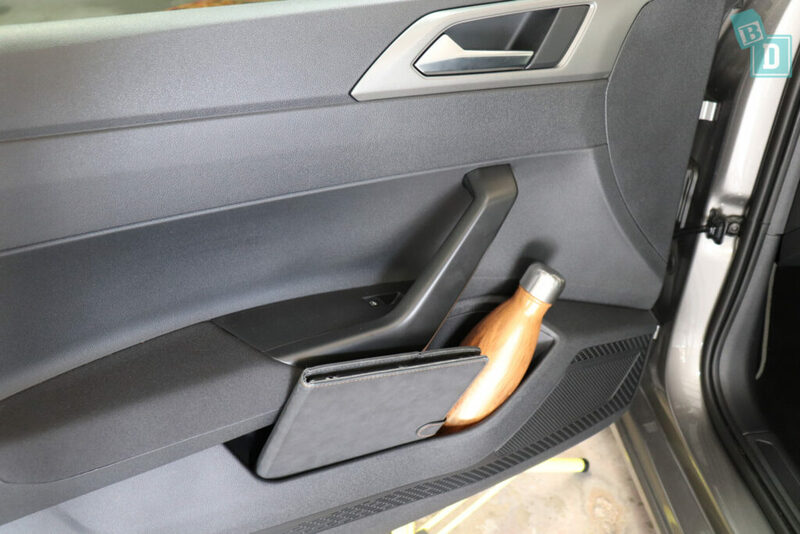 In the rear seats, the storage is very minimal, there are just the door bins, which are smaller than in the front but will hold a large refillable water bottle. How noisy is the VW Polo? 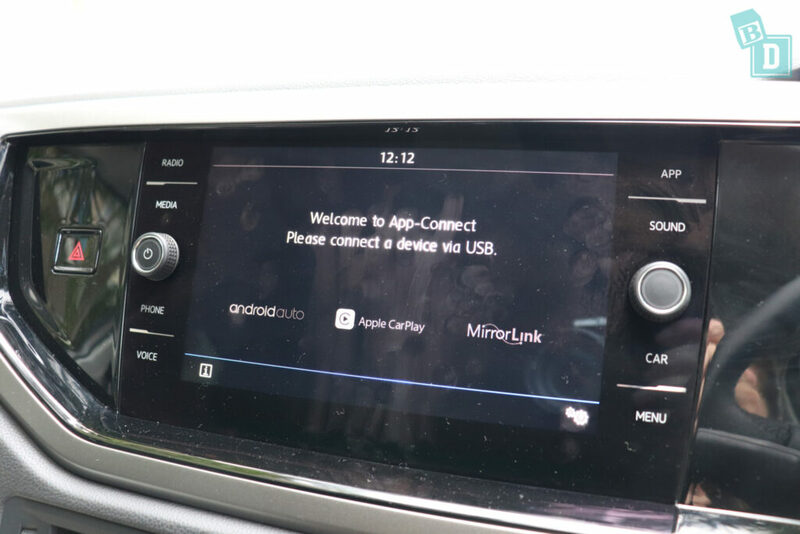 The media system in the VW Polo is great, it's simple, modern and easy to navigate. 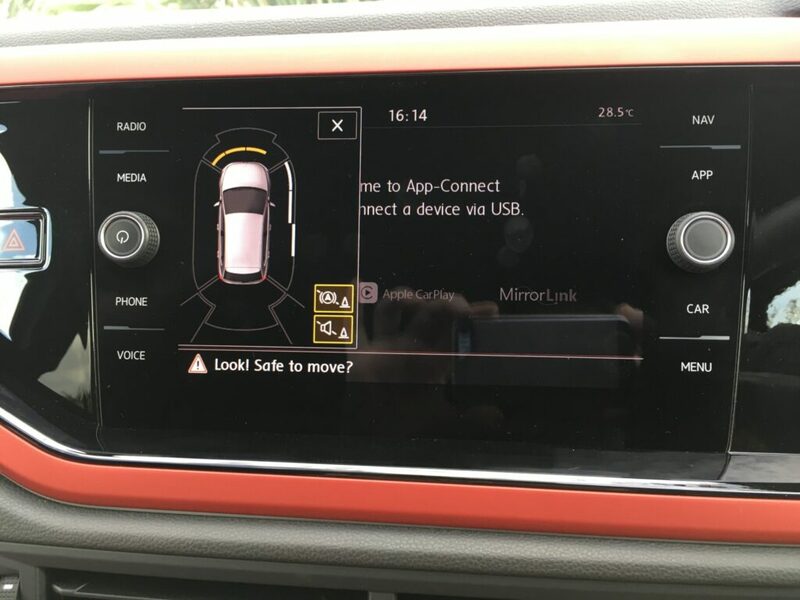 It has Apple CarPlay and Android Auto and I found it easy to connect my phone too. 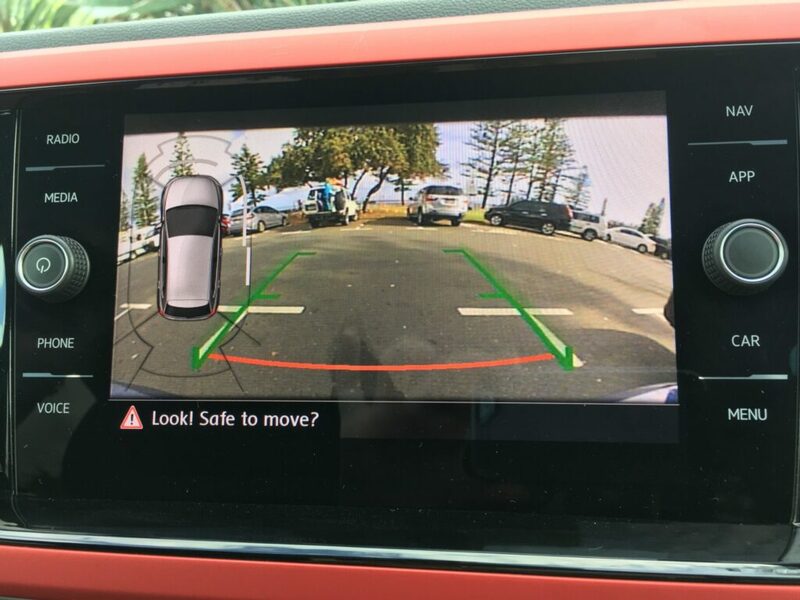 The reversing camera has a really nice and clear image for a small car. I found I could mute the parking sensors with a button on the park pilot screen. The VW Polo is quite quiet when driving, the GTI obviously has the exhaust and engine noise you would expect in a sporty hatch. The cruise control is simple to use, the controls are on the left on the steering wheel and I found it to be good for flat, straight motorway driving. The VW Polo was an easy car to park because it is so small, it has a great turning circle and it felt a lot less cumbersome to maneuver in a Kindy car park than the big SUVs I am used to! The doors, windows and indicators are all nice and quiet to use in the VW Polo, so I don't think you'd need to worry about them waking a bub that's asleep in the back. 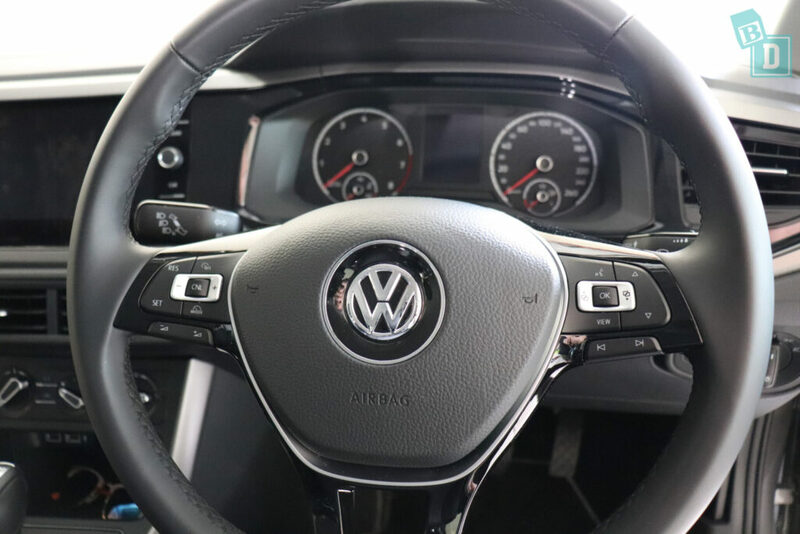 The seatbelt display is one of my favourite features in the VW Polo, it clearly displays which rear seat does or doesn't have a seat belt fastened and an alarm and a light flashes in the seat that a seatbelt gets unfastened. How many child seats fit on the VW Polo? 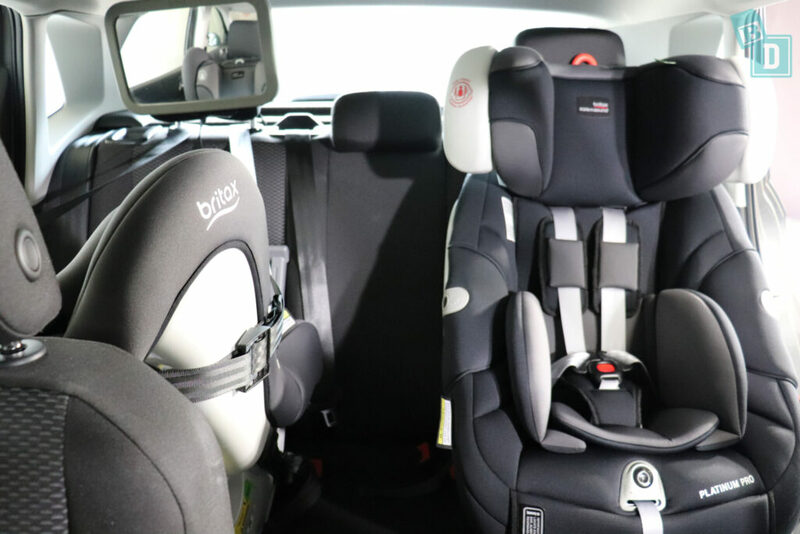 There are ISOFix points in both the outer rear seats, they are within plastic guides and nice and easy to connect to. 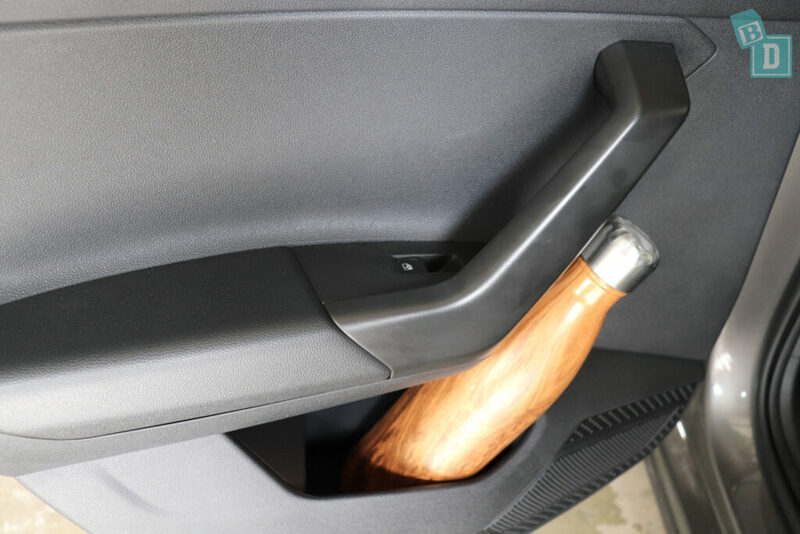 There are top tether anchorages in the back of all three rear seats, all within plastic guides, easy to connect to and to access through the boot. One consideration I am learning with most Volkswagens is the headrests are not removable which really pushes the forward facing child seats forward at the top and my daughter moaned continually about it. When posting bub into their child seat from outside the car you do have to watch their little heads on the door frame and your own when reaching in to fasten their harness. There is room to feed bub in the back if you only have one child seat installed. How comfortable is the VW Polo? I enjoyed the sporty style seats in the VW Polo GTI, I find them hugging and supportive, but both spec cars were comfortable to drive. The headrests were not adjustable and I could not wear a ponytail! In the base model, the seats were upholstered with woven fabric and in the GTI model, they are leather. For a mum travelling in the back with bub, the outer seats are comfortable. For the first year of our daughters life when we would go out as a family, if I wasn’t driving, I would travel in the back with Tulsi so it’s important to check the back seat comfort as you may be spending a lot of time in them! They were never something I gave any thought to before but I definitely notice a good or bad back seat now! 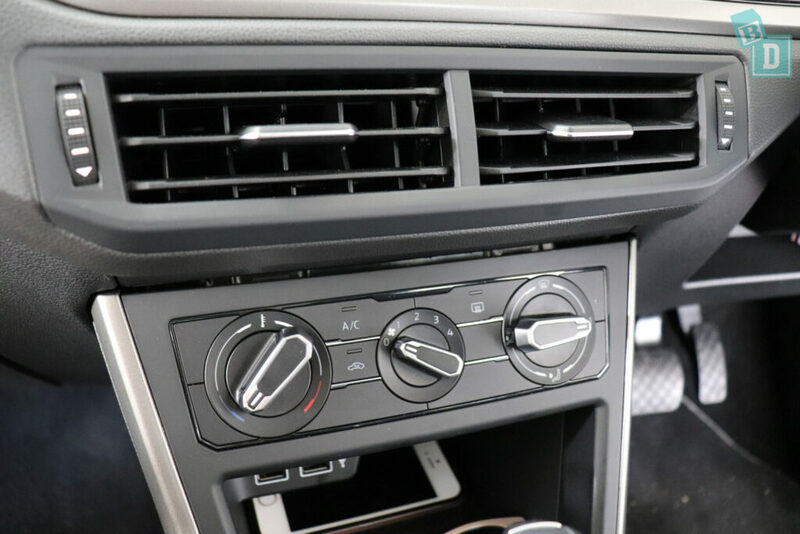 There are four air-conditioning vents in the front dashboard; two in the centre ones and one at either end. The controls are centrally located on the dash and easy to reach and use while driving. 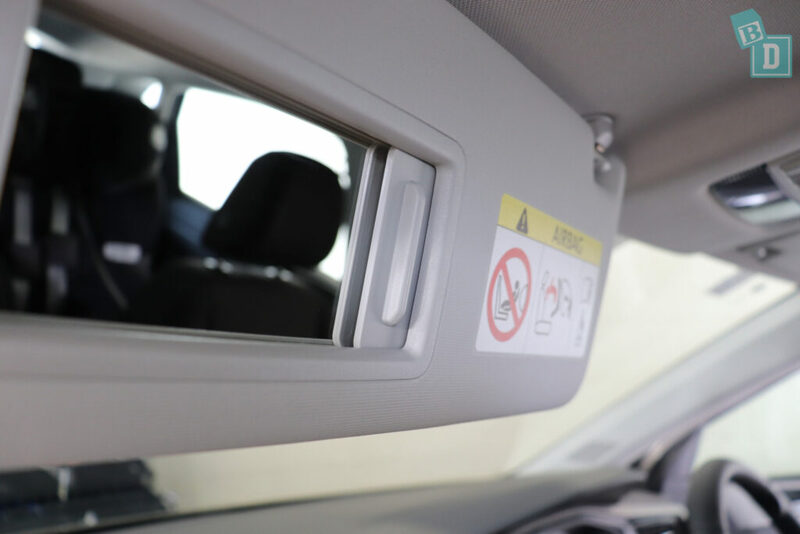 There are vanity mirrors in both front visors but they are not lit. There is no glasses case in the ceiling either. The biggest downside for me is in the sunroof in the GTI model is only covered with a mesh across it, so of course as you drive along you are getting a lot of sun on your skin and it makes the interior very hot! 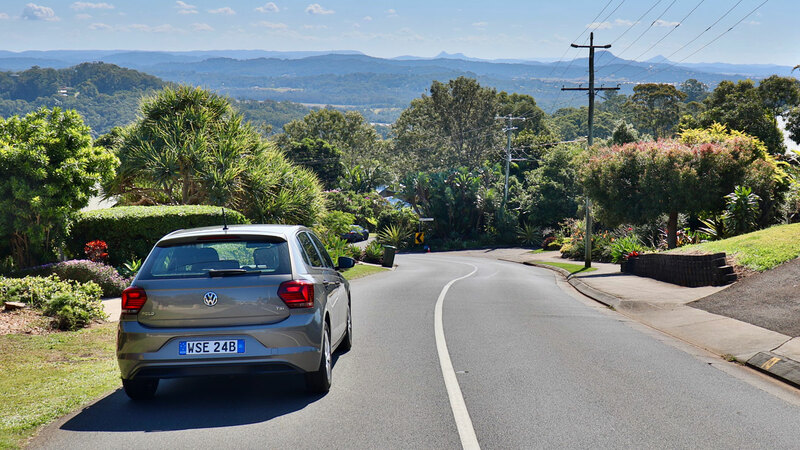 Visibility in the VW Polo is pretty good, being a small car there are few blind spots and the camera image is very good. One thing I have noticed since being a mum is I hate it when I reach a destination or get home from being out and Tulsi has either done really well in the car or she is screaming her head off and I have done really well to keep it together for the entire journey (usually the latter!!) and it takes 10 minutes to park the car! It can be really stressful. Usually I dread parking new cars as they take longer in our tight apartment block carpark, but the VW Polo was fine to park, and visibility wasn't too bad! 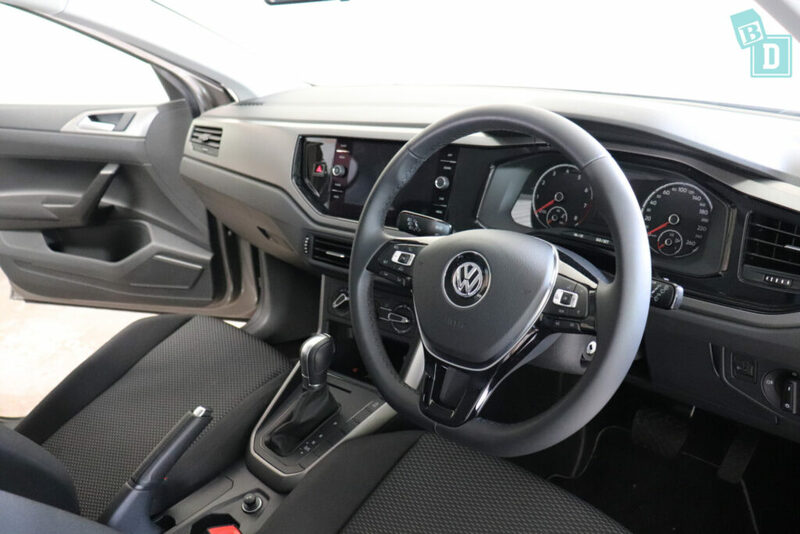 The interior of the base model VW Polo felt quite basic, but they had put a lot of effort into contrast red trims and highlights in the GTI model's interior and it was very similar to that of the VW Golf GTI. How safe is the VW Polo? The VW Polo scoured a five-star ANCAP safety rating in 2017, that is rated for vehicles from 2018 onwards, scoring 96% for adult occupancy and 85% for child occupancy protection, 76% for pedestrian protection and 59% for safety assist. In the adult occupancy testing the scores break down to, 7.56 out of 8 for the frontal offset test, 7.80 out of 8 for full-width frontal crash test, 8/8 in the side impact test and the oblique pole test and 2.36 out of 3 for whiplash protection and 3 out of 3 for AEB (city). 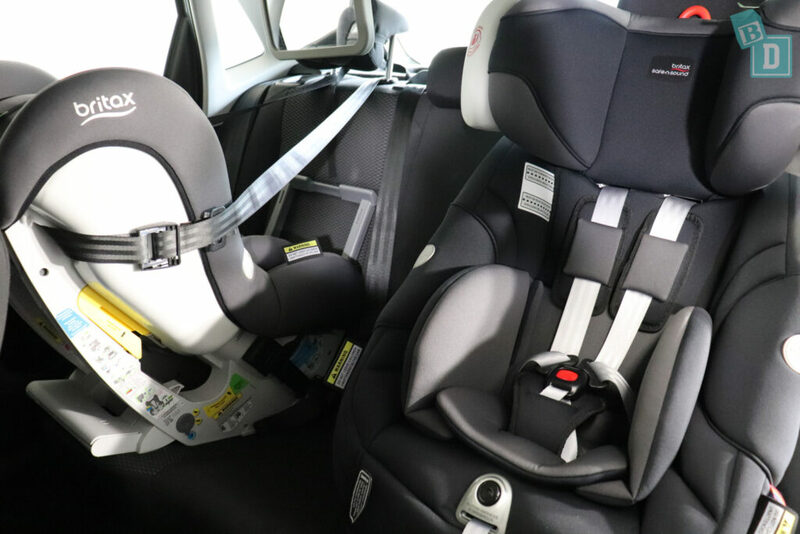 In the child occupancy testing it scores 14.98 out of 16 in the dynamic test (front), 8/8 for the dynamic test (side), 12/12 for the restraint installation and 7 out of 13 for the onboard safety features. Protection of both child dummies in the frontal offset test was GOOD apart from the neck, rated as ADEQUATE for the 6 year dummy and MARGINAL for the 10 year dummy. It comes with six airbags as standard. 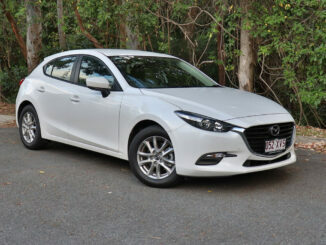 Dual frontal and chest airbags for both front passengers, curtain head airbags for front and rear outboard passengers. The VW Polo also comes with seatbelt pre-tensioners in the front and rear outer positions, anti-lock braking system (ABS), autonomous emergency braking (AEB) city and interurban, electronic brakeforce distribution (EBD), electronic stability control (ESC), emergency brake assist (EBA), an emergency stop signal (ESS), fatigue reminder, forward collision warning (FCW), daytime running lights (DRL), hill launch assist, secondary collision brake assist and tyre pressure monitoring system (TPMS). Adaptive cruise control (ACC), automatic headlights, automatic high beam, blind-spot monitoring (BSM) and lane keep assist (LKA) is available on different spec models.